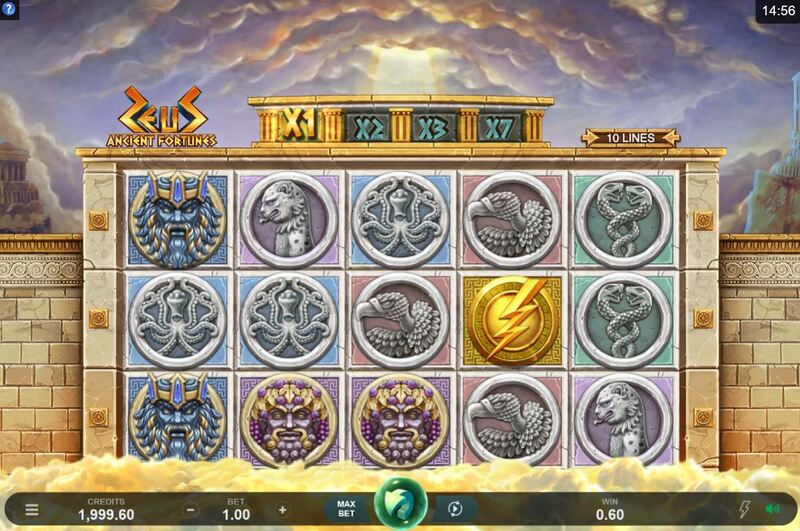 Ancient Fortunes Zeus slot, like most Microgaming slots of late, is developed by a smaller in-house studio, in this case Just For The Win. Their previous efforts such as Goldwyn's Fairies, Lucky Links and Deco Diamonds have had a mixed reception and haven't really set the slotting world on fire although the first of those has a few fans for some reason. Here we have our reels over a classic Greek Temple with dramatic music and the crashes of thunder and lightning we associate with Zeus, so a good start. Even better, this game seems to be far more exciting upon first impressions than the tired old WMS trio of Zeus 3, Zeus 1000 and Zeus God of Thunder which were poor sequels to their original and good Zeus slot. So can our Zeus here bring some modern fortune our way? Ancient Fortunes Zeus slot has a cascade mechanic. All winning tiles are replaced from above and we have 10 fixed pay lines that also pay from right-to-left. A clue to the volatility comes via the 5-of-a-kind pays which are quite high, Spartan Helmet 62.5x, Zeus Mosaic 30x, Grapes Mosaic 12.5x, Athena 7.5x with 4 lower-paying tiles of Eagle 5x, Octopus 4x, Cat 3.5x and finally Snakes 2.5x. You can see gold Wilds in any position and Lightning Scatters too. 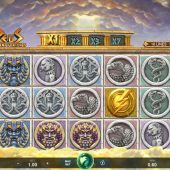 Any wins you get will be paid at 1x, then a second winning cascade at 2x, a third consecutive cascade at 3x and from four onwards all wins are paid at 7x. This would result in 437.5x for the best 5OAK at the highest multiplier. You need to get 3 Gold Lightning scatters on a pay line which can be any direction from the first or fifth reel. This will award 10 free games which can be retriggered in the same way. Your enhancement in this case is 3x pays therefore your cascade multipliers are now 3x, 6x, 9x and 21x therefore you could win over 1300x bet for the top pay on the best multiplier. Some serious potential here!